This card cannot be Special Summoned. When this card is Normal Summoned, you can equip as many Equip spell Cards from your Graveyard as possible to Warrior-Type monster(s) on your side of the field. When this card is destroyed as a result of battle and sent to the Graveyard, you can Special Summon 1 EARTH Warrior-Type monster with an ATK of 1500 or less in face-up Attack Position from your Deck to your side of the field. Then shuffle your Deck. If this is the only card in your hand, you can Summon this card in face-up Attack Position without offering monsters as Tributes. This is treated as a Normal Summon. As long as at least 1 other monster exists on your side of the field your opponent cannot select this card as an attack target. Also, as long as this card remains face-up on the field, increase the ATK of all Warrior-Type monsters by 400 points. As long as this monster remains face-up on the field, your opponent cannot select another Warrior-Type monster on your side of the field as an attack target. When this monster is Normal Summoned successfully, you can Special Summon 1 Level 4 or lower Warrior-Type monster from your hand. Offer this face-up card on your side of the field as a Tribute to destroy 1 monster on the field. If this card is used for a Tribute Summon or this card is offered as a Tribute due to other cards' effects, this card's effect is not activated. If you Normal Summon this card, you must place it in face-down Defense position. If this card attacks a face-down Defense position monster, destroy the monster immediately with this cards effect without flipping it face-up or applying damage calculation. 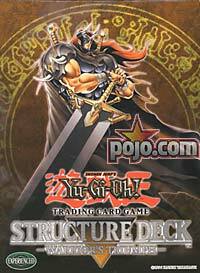 During the End Phase of a turn that this card destroyed a monster as a result of battle, send this card to the Graveyard to Special Summon 1 "Mystic Swordsman LV6" from your hand or Deck. You can only equip this card to a Warrior-Type monster. Increase the ATK of the equipped monster by 300 points. If this card is in your Graveyard during your Main Phase, by removing from play 2 Warrior-Type monsters from your Graveyard, add this card to your hand. Move one Level 4 or lower Warrior-Type monster from your Deck to your hand. Your Deck is then shuffled.